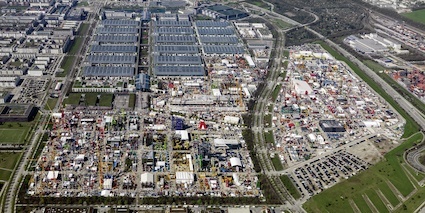 Nothing in global construction trade shows can be compared to the German exhibition bauma Munich, and in April next year, it is time for the 32nd edition of the show. PDi Magazine has already started reporting what’s coming up in each issue up and will continue to do so until the show. If attending bauma 2019, be assured you will be able to nd us at our usual spot there in hall A1. It is already heating up for the bauma international building and construction exhibition which will be held in Munich, Germany from 8-14 April, 2019. bauma’s chairman and managing director recently visited the German Swedish Trade & Commerce Chamber in Stockholm together with the German trade association VDMA’s chairman, as well as the president of the construction hoist manufacturer GEDA-Dechentreiter. VDMA chairman, Johann Sailer stated that next year’s bauma is expected to be the biggest ever; maybe this is something organisers often say, but in bauma’s case, it is usually true that the exhibition surpasses itself year after year. It has also been said that bauma can’t expand any more in terms of size, but that is proving to simply be not true. For next year’s event, two more exhibition halls has been constructed, and about 9,000m2 of outdoors exhibition area has been added. Over 3,500 companies, from almost 60 countries, will exhibit, and well over 600,000 people are expected to come to the show. With an exhibition area outside covering 614, 000m2 and 18 indoor halls covering 200,000m2, bauma is still the world’s biggest trade show. Another reason why bauma 2019 deserves special attention is the fact that many countries around the world are experiencing growth in their construction and building industries, with increased demand for new equipment and tools. At bauma 2019 there are set to be many different focuses, with the biggest being digitalisation in building and construction. How digitalisation applies, and how construction machinery can be integrated in networks in order to increase the efficiency of equipment and methods, is set to transform the industry. This is particularly applicable concerning all the product sectors that PDi Magazine focuses on. From the right, Bauma president Claus Dittrich andVDMA’s chariman Johann Sailer. bauma traditionally has a partner country, and in 2019 the partner country is to be Canada. The reason why Canada was chosen is partially due to the CETA free trade agreement that was signed between Canada and Europe recently. Canada will have its own special day at the show, and there is to be a Canada pavilion, a Canada lounge and a number of Canadian exhibitors set to be at the show. Those of our readers that have visited bauma before will know well that it is possible to send virtually everything related to the building and construction industry at the show. PDi Magazine specifically covers equipment and tools for demolition, recycling, concrete sawing and drilling, hydrodemolition, waste handling, dust and slurry extraction, concrete floor grinding and polishing etc, and these sectors will be well represented at the show. In hall A1 visitors will find all sorts of things that are of interest, with virtually every equipment and tools supplier for these sectors being represented. Hall A1 is the first hall located on the right hand side when entering the show’s main entrance. Here PDi Magazine’s booth, number A1.136, can be found. If interested in demolition excavators and hydraulic tools for demolition, recycling and waste handling, these will be spread throughout halls A5, A6, B5, B6, C4, C5 and C6, and also in the outdoor areas F4/ F5, FM and FN. If attending the show, it is highly recommended to be well prepared before. Plan in advance which companies you wish to visit and where they are located, as the sheer size of the exhibition makes it almost impossible to see everything, even if you attend all seven show days. There are a number of trade associations that will both exhibit and organise their own events in conjunction with bauma during the 2019 show. For instance, the international concrete cutting association, IACDS, has organised its Diamond Awards to coincide with the show, and will hold its annual convention directly afterwards. The European Demolition Association, and several other trade associations, such as the German concrete sawing and drilling association, the German demolition association and the German building and construction association, VDMA, will also be represented at the show. Check out their websites for more detailed information concerning their activities. bauma was organised for the rst time 1954, so the 2019 edition will be the 32nd. Few other trade exhibitions anywhere in the world have been running for so many years. A fun fact is that the biggest construction machine that has ever been displayed at the show actually weighed more than an A380 aircraft, which is currently the biggest airplane in the world. The machine was the Komatsu P7000 dump truck, which weights some 685t, while an A380 weighs only (!) 560t. 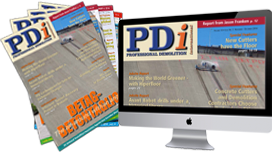 Starting with this issue, you will find bauma previews which will continue in each PDi until PDi 2-2019, which is our show issue for bauma. PDi 2-2019 will be distributed before the show, and is also distributed during the show. So join PDi Magazine at the biggest trade event ever, the tri-annual bauma Munich.